There is currently just the 1 ferry route running between Germany and Latvia operated by 1 ferry company – Stena Line. The Travemunde to Liepaja ferry crossing operates weekly with a scheduled sailing duration from about 26 hours. Whilst we’ve taken great care to ensure the information on this page is correct, as the frequency and duration of crossings on all routes can vary from time to time we’d advise that you get a live quote for current availability on this Germany Latvia crossing between Travemunde and Liepaja. 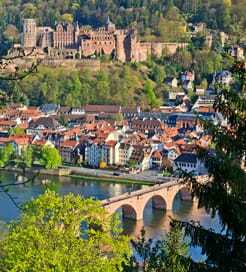 Germany is a large nation in west-central Europe, known for its spellbinding landscapes, rich history and iconic cuisine. Aside from the stereotypical Bavarian culture of beer, sausage and pretzels found in the south, Germany is a hugely diverse country, offering something for everyone. The capital, Berlin has architectural masterpieces, the famous black forest covers the west, whilst the Alps on the southern border offer great skiing spots. Remnants of the country’s long history can be found almost anywhere, too, whether you’re strolling past the Berlin Wall, touring a World War II museum or marvelling at a medieval hilltop fortress. With a coastline stretching almost 2,500 kilometres, Germany has a wide selection of ports to choose from. There are numerous ferry routes provided to Scandinavia and the Baltic nations, making it an excellent transport hub for northeast Europe. 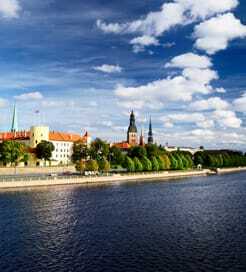 Latvia is a Baltic Nation in northern Europe, sandwiched between Estonia to the north and Lithuania to the south. With its turbulent Soviet rule now in the distant past, Latvia has thrived as one of Europe’s up and coming tourist destinations. Seemingly endless nature makes up the majority of the landscape, with unspoilt forests and sparkling lakes offering mouth-watering backdrops to any hike or bike ride. Latvia’s capital and primary cultural attraction, Riga is a cosmopolitan, cobblestoned city with a UNESCO World Heritage Site decorated old town. Straddling the Daugava River, it offers a mix of historical splendour and contemporary entertainment, boasting some excellent nightclubs alongside some wonderful, wooden architecture. For a relatively small country, Latvia has a few ports along its five hundred kilometre coastline, so it’s easy to reach by ferry. Across the Baltic Sea, there are numerous routes from countries in northern Europe and Scandinavia.